1. Unusual presentation of gout with tophi at pubic bone as the first sign of gout. 2. Differentiation of such lesion from infection and tumor. Medical Officer, Department of Orthopaedic Surgery, Dr R N Cooper Hospital, Vile Parle, Mumbai- 400056. India. Introduction: Chronic tophaceous gout classically occurs after 10 years or more of recurrent polyarticular gout. However, tophi can also occur as first sign of the disorder. 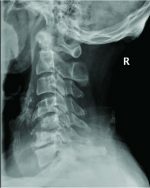 Case Report: We report the case of a 60 year female with tophaceous involvement of the pubis bone which is an unusual location for this type of pathology without any prior manifestation of gouty arthritis. Conclusion: Tophi can present in unexpected locations, even as the first sign of gout, often mimicking infection and neoplasia and vigilance is required when unusual symptoms or signs occur in a patient with gout. Keywords: Gout, Tophus, Pubis Bone. Gout, a type of inflammatory arthritis that results from deposition of monosodium urate (MSU) crystals in the synovial fluid and other tissues, typically follows a clinical course, first with years of asymptomatic hyperuricemia, followed by acute intermittent attacks, and eventually with chronic arthritis with the formation of tophi, or collections of MSU crystals that have served as the nidus of a granulomatous reaction . Although gouty tophi are seen in chronic disease, tophi may be first sign of the disorder. Here, we report a sixty-year-old female with normal blood uric acid level who presented with tophus of the pubis bone as a cause of groin pain prior to any other manifestation of gout. A 60 year old female was admitted with a 5 day history of severe pain in the right groin and right hip and was unable to weight bear . She had no previous history of any medical co-morbidity. On examination there was diffuse tenderness in the right groin and she was unable to lift the right leg due to pain. Significant blood results included erythrocyte sedimentation rate 33mm/hr, leucocyte count 12800/cmm , serum creatinine 0.67mg/dl and serum uric acid 5.6 mg/dl. Blood cultures were negative. Plain x-ray examination of the pelvis showed extensive osteolytic involvement of the right pubis bone. MRI of the pelvis showed a lesion involving the right pubic bone which showed mild expansion and predominantly lytic in nature with associated lobulated soft tissue between pectineus and adductor muscles suggestive of a neoplastic etiology. 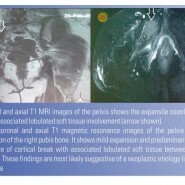 Subsequently a CT guided biopsy of the pubic soft tissue lesion was done. The histopathological examination of the biopsy material showed fibrocollagenous soft tissue with multiple deposits of urate crystals surrounded by several multinucleated giant cells, histiocytes and lymphocytes. There was no evidence of caseating epitheloid granulomas or malignancy. The above histopathological report confirmed the diagnosis of gouty tophus and ruled out other crystallopathy such as pseudogout. Treatment was started with colchicine 0.6 mg twice daily, and morphine was required for adequate analgesia. After 48 hours, she was able to mobilise independently with a frame and was discharged home several days later. Subsequently, low dose allopurinol was added under the colchicine cover and was slowly titrated to a maximum dose of 150 mg daily. The patient was followed up for a period of one year on telephonic conversation. She was taking anti-gout medications regularly and was pain free. However no biochemical or radiological investigation were available in the follow up period. Gouty tophus can be the first manifestation of gout and can exist even in the absence of arthritis. Tophi can present in unexpected locations often mimicking infection and neoplasia. Clinicians should be aware of both the above possibilities and investigate thoroughly in such cases. 1. M. A. Becker, “Hyperuricemia and gout,” in The Metabolic and Molecular Bases of Inherited Disease, C. R. Scriver, A. L. Beaudet, W. S. Sly et al., Eds., pp. 2154–2155, McGraw-Hill, New York, NY, USA, 8th edition, 2001. 2. A. J. Luk and P. A. Simkin, “Epidemiology of hyperuricemia and gout,” American Journal of Managed Care, vol. 11, no. 15, pp. S435–S442, 2005. 3. Hench PS. The diagnosis of gout and gouty arthritis. J Lab Clin Med 1936;22:48-55. 4. Boss GR, Seegmiller JE. Hyperuricemia and gout: classification, complications and management. N Engl J Med 1979;300:1459-68. 5. Wallace SL, Singer JZ. Therapy in gout. Rheum Dis Clin North Am 1988;14:441-57. 6. Kumar S, Gow P: A survey of indications, results and complications of surgery for tophaceous gout. N Z Med J 2002, 115:U109. 7. Koley S, Salodkar A, Choudhary S, Bhake A, Singhania K, Choudhury M. Tophi as first manifestation of gout. Indian J Dermatol Venereol Leprol 2010;76(4):393-6. 8. Gardner H, McQueen F. Tophaceous gout of the pubic symphysis: an unusual cause of groin pain. Ann Rheum Dis 2004;63:767–8. 9. Castagnoli M, Boileau de Paulis L. Case of gouty pubic symphysis syndrome. Clin Ter 1975;72:81–8.